In small bowl, mix 1/2 teaspoon of the cinnamon, 1/3 cup of the granulated sugar and the brown sugar until well mixed. Cut 4 tablespoons of the butter into small pieces, and add to bowl; cut into mixture, using pastry blender or fork, until mixture is crumbly. Separate crescent dough into 8 triangles. Place 2 peaches on widest end of each triangle. Spoon about 1/2 teaspoon sugar mixture onto each peach slice. Roll crescent to opposite point; arrange in baking dish. 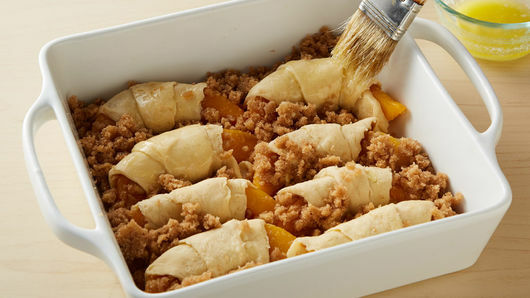 Sprinkle any remaining sugar mixture in dish around crescents. In small microwavable bowl, heat remaining 2 tablespoons butter uncovered on High 20 to 30 seconds or until melted. Brush tops of crescents with melted butter. In small bowl, mix remaining 1/4 teaspoon cinnamon and remaining 1 tablespoon granulated sugar. Sprinkle on top of crescents. Bake 30 to 35 minutes or until deep golden brown and baked through. Let stand 10 minutes before serving. Serve warm with vanilla ice cream. 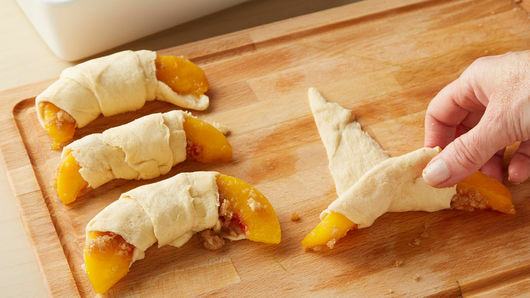 Feel free to substitute fresh peeled and sliced peaches, especially during peach season! 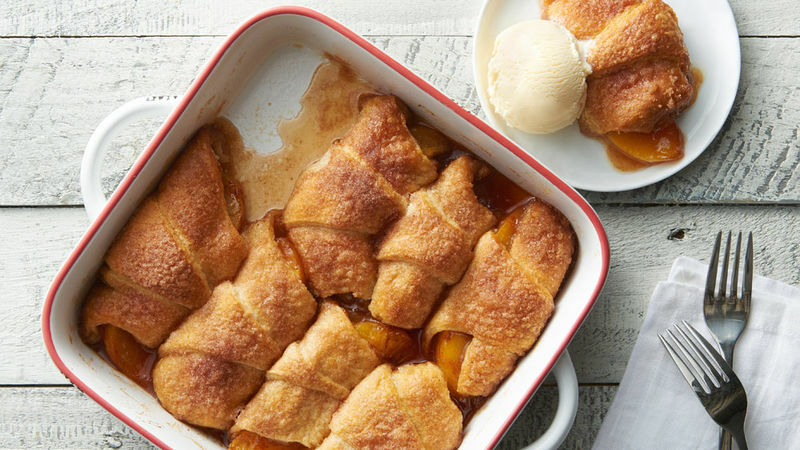 This dessert is best served warm, right from the oven.